Offering you a complete choice of products which include goliath crane, heavy duty goliath crane, double girder goliath crane, electric operated goliath crane, portable goliath crane and semi goliath crane. For the variegated requirements of different industrial sectors, we are manufacturing and supplying a broad array of Heavy Duty Goliath Crane. In order to manufacture this crane in adherence with the international standards, our experts use finest quality raw materials by employing ultra-modern technology. Find its usage in outdoor, warehouse and precast yard, this Heavy Duty Goliath Crane is tested under the supervision of expert quality controllers as per the certain quality parameters. 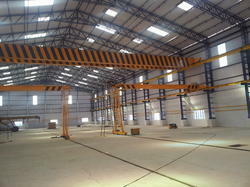 Years of experience in the arena of material handing equipments manufacturing has helped us in evolving ourselves as prime manufacturer and supplier of Double Girder Goliath Crane. To develop these goliath cranes in compliance with international quality standards, we procure superior quality materials from trusted vendors of the market. 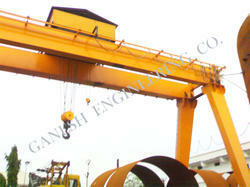 This Double Girder Goliath Crane is specially used in ports, engineering industry, steel yards, cement pipe industry, open yard and storages places to handle heavy loads. 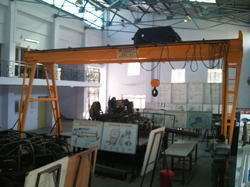 Possess an immense amount of knowledge in this material handling manufacturing industry, we are engaged in manufacturing and exporting a comprehensive range of Goliath Crane. 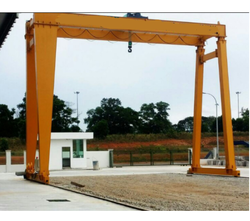 Find usage in areas where heavy load transportation facility needed, these cranes are ideal for loading heavy goods and move smoothly. Moreover, our offered range of Goliath Crane is engineered in accordance with industry standards using certified quality metals. Committed for delivery of products on-time and in a commendable way, we are involved in manufacturing, supplying and exporting a commendable range of Portable Goliath Crane. 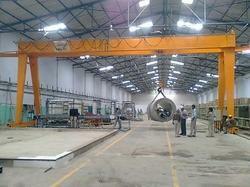 These cranes are manufactured under the supervision of our qualified professionals employing certified quality of metals. Available in various capacities ranging from 1 to 200 tons, our Portable Goliath Crane is mostly used in shipping yards, hydroelectric projects and mines. 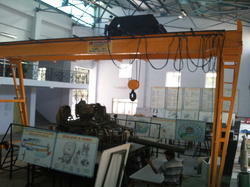 Holding profound knowledge in material handling equipment manufacturing industry, our company is considered as the pioneering manufacturer, supplier and exporter of Semi Goliath Crane. Precisely engineered in compliance with industrial standards using advanced technology, we are offering these goliath cranes in wide range of specifications. Suitable to be used in construction industry, shipping yards, road sides and mines, we are offering Semi Goliath Crane to the clients without any delay. Looking for Goliath Cranes ?